Well, sort of. 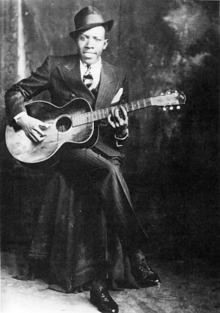 The note progressions and the lyrics are still the same but musicologist are now saying we’ve spent close to the last 50 years listening to Robert Johnson at the wrong speed. This article came out in 2010 and I’m just hearing about it now, which is unacceptable. Regardless, does this not just blow your frickin’ mind? An error years ago changed the face of blues and music forever. I’m utterly speechless. I find this so cool and incredibly interesting. Below is the version we all know and love. The frantic playing. That yearning, almost childish, voice followed by the slower and seemingly proper version of the same song. The latter sounds much more like bluesmen of the time. A Low voice and some contemplative an patient guitar playing. I haven’t fully absorbed this new information so I can’t really make an opinion on the matter. This entry was posted in albums, sans jazz, Video and tagged article, blues, delta, music, robert johnson, vinyl. Bookmark the permalink.